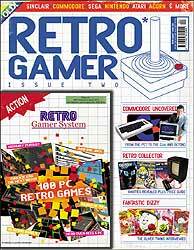 Lots of retro features, new game news and lots lots more. Issue two seems miles better than the first issue and its now finding its feet. At 6 pounds of earth money complete with cover disk (issue II has retro remakes on it, with games from PeeknPoke's gold award gif creator, Smila no less) It deserves to win. PeeknPoke will keep you posted on its success here.